The Ninth on Charlotte Street is the latest restaurant by chef Jun Tanaka, a chef who has worked at some of London’s best restaurants including Le Gavroche, The Restaurant Marco Pierre White and The Square. Jun’s last venture was Pearl – a gem of a place at what was previously the Renaissance Chancery Court Hotel in Holborn. At Pearl, the food was a refined, modern take on classical French cooking. With The Ninth, Jun has migrated to a sharing menu that boasts of French Mediterranean-style dishes. One might call The Ninth cosy, but I felt the more appropriate word to describe it was cramped. The restaurant was very small and tables had been squeezed into every spot imaginable, including the one where we were perched which was right by the front door. It was a very unpleasant spot, especially as every time the door opened it let in a draft, which was basically about every 5 minutes. I had great expectations about The Ninth, having thoroughly enjoyed the wonderful and precisely cooked food at Pearl on several occasions before it closed. The a la carte menu at The Ninth – available at lunch and dinner – was divided into various sections including hot starters, a raw and cured section, fish, meat and vegetables. It made for an inviting read with many lovely sounding dishes. 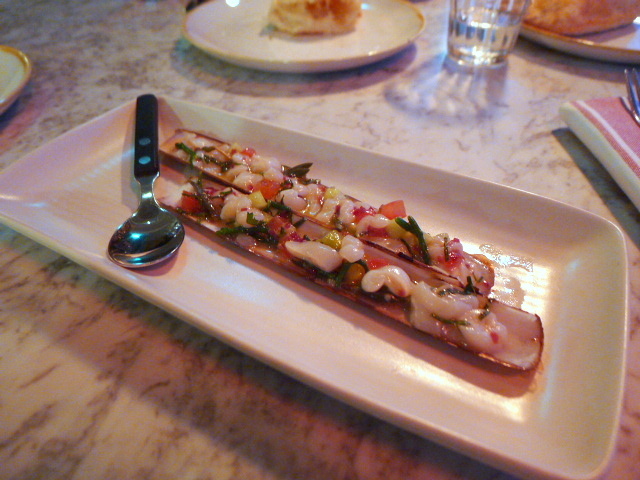 From the raw and cured section, a razor clam ceviche (£9.50) was pleasant but underwhelming. The razor clams were fresh and had been nicely dressed with the right level of acidity. But the dish lacked for seasoning, and in all, the ceviche was just a little bit boring. The razor clams had a very gentle flavour, and what the dish needed was something to lift it. Even some contrasting crunchiness would have helped the dish by giving it added texture. 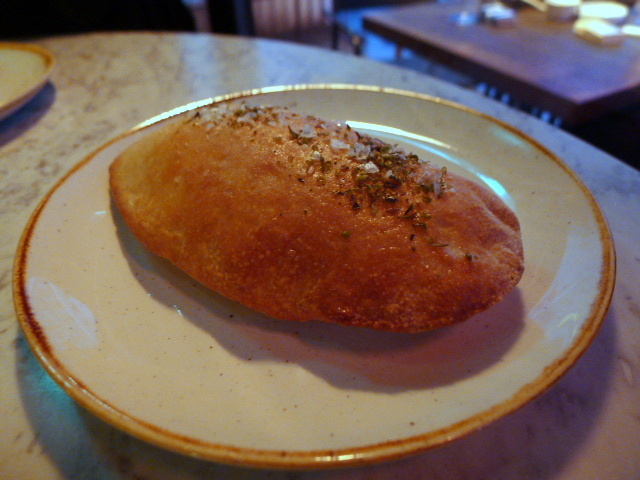 Some freshly baked pitta with oregano and sea salt (£3) was lovely and warm with a soft, fluffy centre. The seasoning had been well judged. 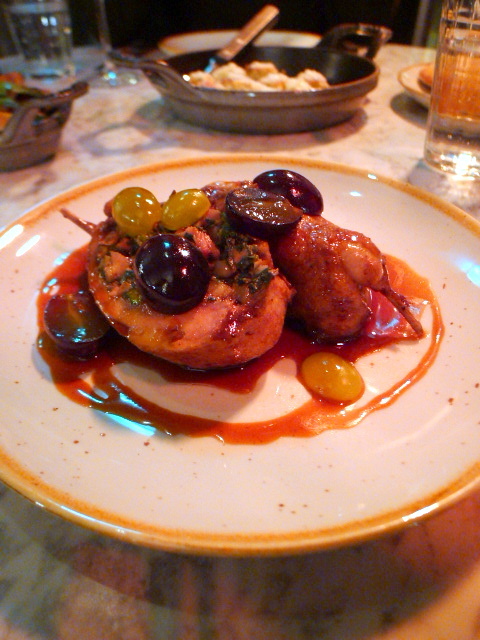 A whole roast quail (£15) with smoked bacon, stuffed with foie gras and pistachios and served with grapes was really lovely. The quail had been nicely cooked, especially the thigh meat which was wonderfully moist. The quail was superbly meaty and the filling of foie gras and pistachios worked really well with it. The saltiness of the bacon and the sweetness of the grapes providedan enjoyable . 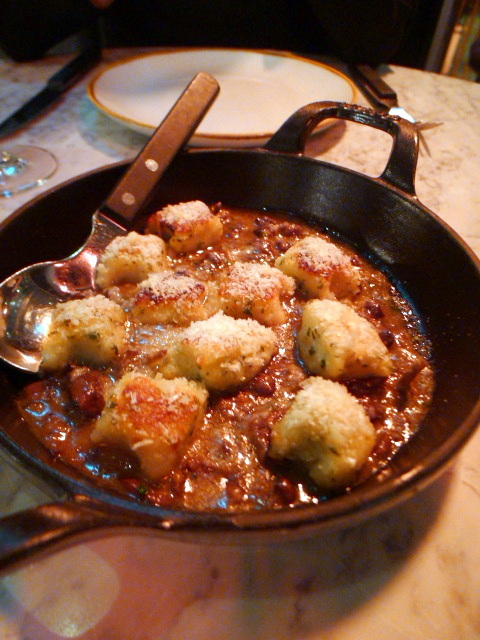 From the vegetable section, pan-fried herb gnocchi (£16 – large) offered a light, fluffy texture and had been really well made. The gnocchi was perched on a base of mousserons and sautéed shallots which were tasty, except for the fact that it was very salty. The overseasoning let the dish down. 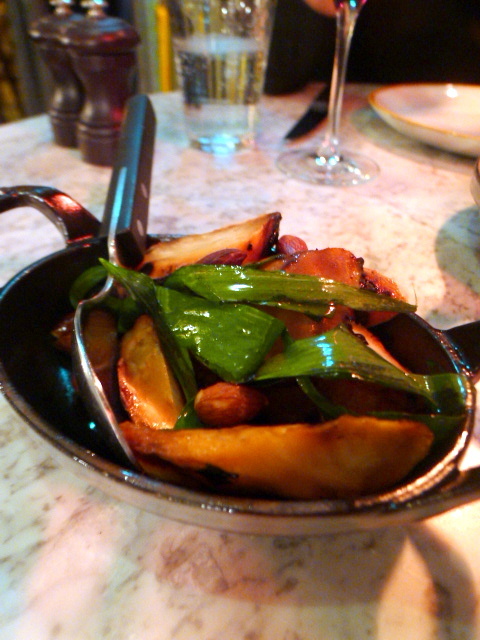 Another vegetable dish of charcoal roasted celeriac (£5), smoked almonds and wild garlic was yet another underwhelming plate. The celeriac was salty and undercooked. Furthermore it was difficult to get the any discernible flavour from the smoked almonds or the wild garlic. The Ninth is not without its plus points. There was some good cooking to be had, some clever ideas, some moments of excellence. But there were equally a smattering of errors ranging from under seasoning to over seasoning to undercooking. And notwithstanding that we were given the worse table in the house, the service also took longer than it should have. The Ninth had great potential, but it was also evident that the running of the kitchen needed some fine-tuning. All these factors made our evening a little trying. It’s disappointing that the standards didn’t match the precision of its predecessor Pearl. The Ninth is a 90-seater and it seemed to me that the restaurant was packing in as many covers as possible, resulting in compromised levels of consistency. Still, Jun Tanaka is a big name in the world of food and he will continue to be a draw card. 2) Being given the table right by the front door. 3) The restaurant is very cramped. 4) The celeriac dish was poor. 5) The knowledge that it ought to have been better. Average Price: £40 to £50 average a head.